Easy tools for planning, facilitating, and reporting. An innovative and fun structured networking program. Flexibility with any number of tables, rounds, seats per table, and time at each table round. Post-event follow-up assistance through reports showing attendees at each table during each round. An expandable platform that allows for activities other than networking such as corporate brainstorming, industry discussion forums, etc. Effective networking for a membership base that is craving effective programming. Unique event available only through Ignite. Networking with more people than through typical networking events. An innovative and fun event that is far-and-away more exciting than run of the mill “cocktail reception” activities. A more comfortable and fun networking environment. Networking with new people at every round of networking. 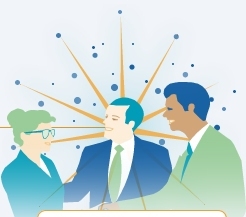 Environment to learn effective networking techniques through energized networking conversations and repetition. The opportunity to practice proper networking, elevators speeches, etc. "I would recommend Ignite to any professional or organization looking to increase networking visibility."